Explanation: Jon Burnett, a teenager from South Wales, UK, was photographing some friends skateboarding last week when the sky did something very strange. High in the distance, a sofa-sized rock came hurtling into the nearby atmosphere of planet Earth and disintegrated. By diverting his camera, he was able to document this rare sky event and capture one of the more spectacular meteor images yet recorded. 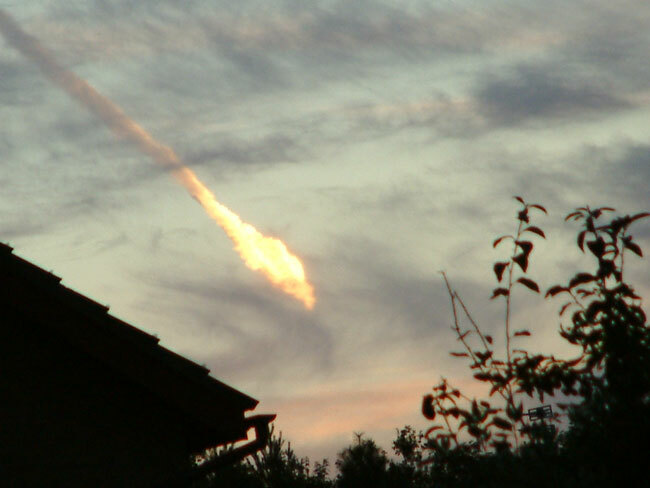 Roughly one minute later, he took another picture of the dispersing meteor trial. Bright fireballs occur over someplace on Earth nearly every day. A separate bolide, likely even more dramatic, struck India only a few days ago.